As I write this I’m watching the television news. Most of the channels are covering the massacre in Thousand Oaks, California, where last evening a young gunman mowed down at least 12 innocent victims, including a law enforcement officer who jumped into the fray to assist. Mass shootings continue to shake our nation, yet like bad train wrecks coming down the tracks, we don’t seem to know how to stop them. We watch them happen, bemoaning the continual bloodshed and ruined lives. We shake our heads, but little gets changed, almost as if a paralysis enters our national psyche that only ends as the days pass and our personal concerns take precedence in our lives. With yesterday’s shootings I felt a jolt that the killings were not in a different U.S. state, but in California. I honestly admit that when I learned the shootings were in Southern California and not in peaceful Nevada County, I was relieved. Unfortunately, dozens of people, including those at the Borderline Bar and Grille and their families and friends, were not so relieved. Individuals are dead, many of them young college students, and others doomed be haunted for years to come. I am not a gun-owner, but I respect the fact that the Constitution guarantees the right to responsible gun ownership. What I don’t respect is the stalemate in which the United States has sunk, i.e., we can’t seem to be resourceful enough to create a bi-partisan legal structure that helps prevent such violent madness, yet still allows conscientious citizens to own guns. What is wrong with us? Why have other societies done so much better with this issue? Friends in Britain, with whom I stay in close contact, feel the United States has lost its moral way when they hear of yet another mass shooting. I wish I had an explanation for them, but I don’t. To a great extent I do blame the Republican Party and its cozy bedroom relationship with the NRA, along with the party’s baffling promotion of extreme “rugged individualism.” Individual rights are important, but not when they put other lives in jeopardy due to rampant gun availability and/or letting everyone and his brother have easy access to firearms meant only for trained professionals. 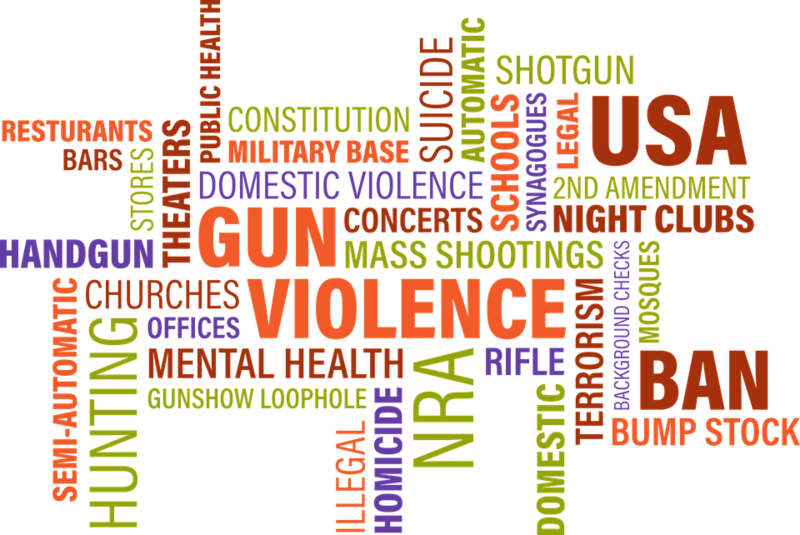 Some time ago I quit using the term “gun control.” Instead, I try to remember to say, “gun safety.” It is a small step, but I’ve found that people, regardless of their political leanings, tend to feel it is a better term for a potentially divisive issue. It comes across as less inflammatory than “gun control” and emphasizes a concept important to all. Everyone wants to live in a safe community, regardless whether they identify as liberal, moderate, or conservative. Safety is paramount in order to lead a healthy, productive life. If rhetoric and accusations are reduced, perhaps intelligent discussion and compromise have a better chance of starting and progress made. Rational communication could encourage a potential deconstruction of the devastating impasse that has resulted not only in multiple deaths, but also in an ideological chasm that threatens to become permanent. If gun issues can be resolved to the point where most citizens are accepting of legal restrictions or requirements that are common sense and functional, perhaps we can then begin to focus on other critical concerns that currently divide us and are preventing this once great country from moving ahead into a positive, unified future.